Our relationship with Chiang Mai has changed. We are no longer exploring this exotic city, known as Thailand’s “rose of the north”. We are saying goodbye. We are retracing our steps, trying to find the places we stumbled on during our first days here, when everything was so fresh and new and exciting. I am also on a mission to try to photograph all the things I haven’t been able to capture as we zoom around the city, our hands busy driving or holding Miss M.
Even on our farewell tour, Chiang Mai was able to surprise us. 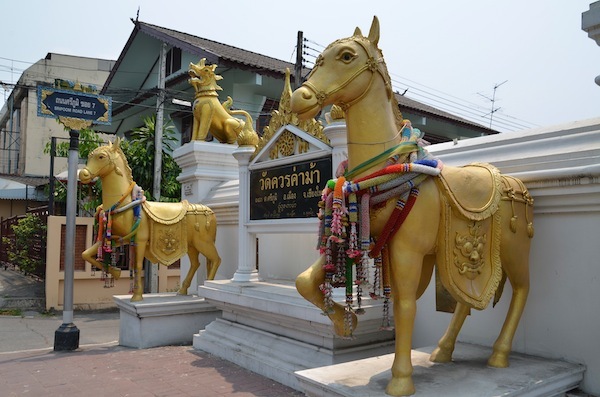 We set off to take photos of what we have dubbed “the horse temple”, officially known as Wat Kuan Ka Ma. Of course, you can’t take photos at the horse temple without popping into the next-door “dragon temple”, Wat Montien. And then, of course, you are so close to mysterious ancient Wat Lok Mali across the road, that you simply must poke your nose in there. Especially as there seems to be some kind of festival going on. 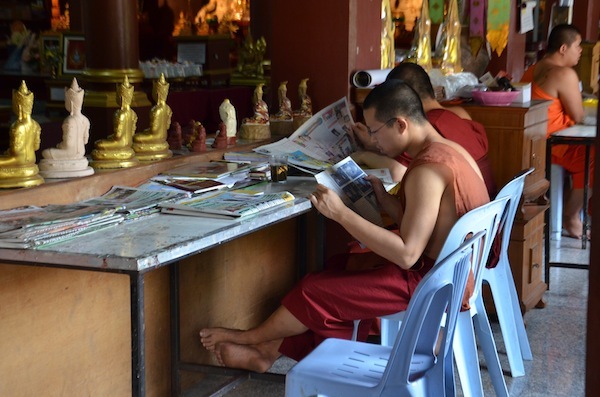 And that’s how we find ourselves in the middle of a novice monk initiation ceremony. I am fascinated and frustrated in equal measures. What is before my eyes is worthy of National Geographic-style photography. Yet what I see in my viewfinder is not up to the standard. I just cannot capture the magic. I found this part of the ceremony to be incredibly endearing. Rather than being a stuffy dreary religious ceremony like the ones I remember from my childhood, it was more an administrative event. 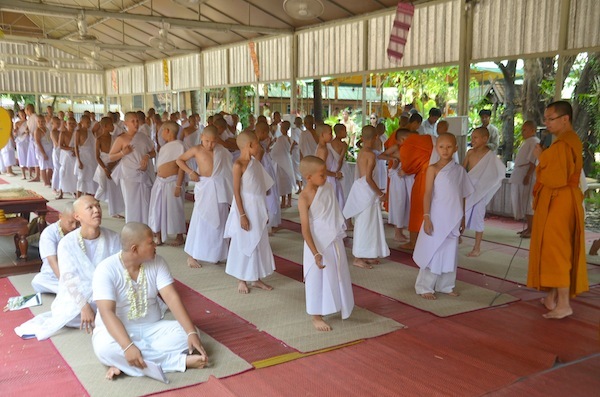 And the novice monks, while mostly well-behaved, wriggled and squirmed like the boys they are. 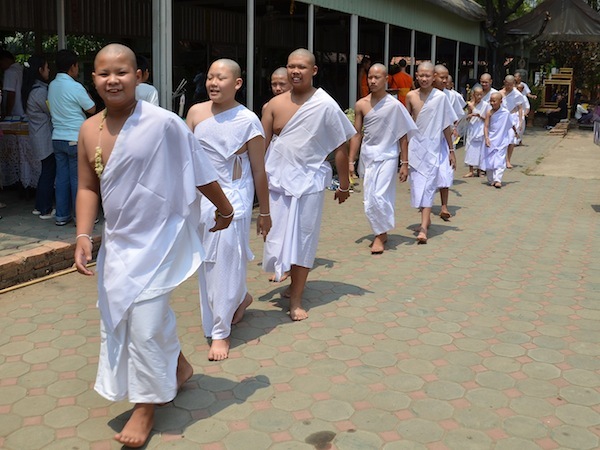 You can see how some of the novice monks are reacting to being barefoot on hot cement in the last photo. I just love Chiang Mai and I’m going to miss this city so much. 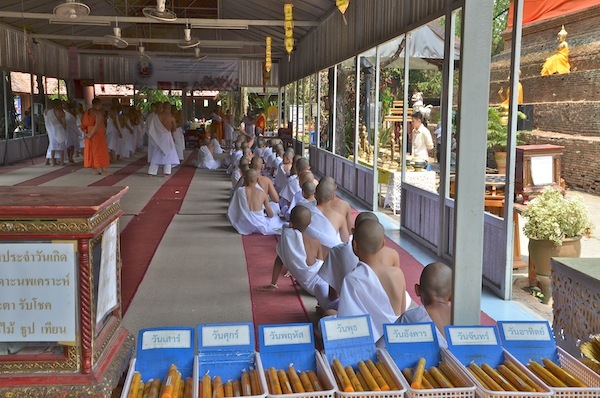 That is so very cool that you got to see a monk initiation ceremony. Very jealous. Hopefully it takes some of the sting off that whole Schengen visa situation. Thanks for reminding me about that, big fella. Always such a charmer. Just kidding. It did take our minds off it for a bit. i love this – from the photos to your lovely words. i am sure you will miss this place. I am missing it before we even leave!! I think this is one place we will definitely return to. There is so much magic here. 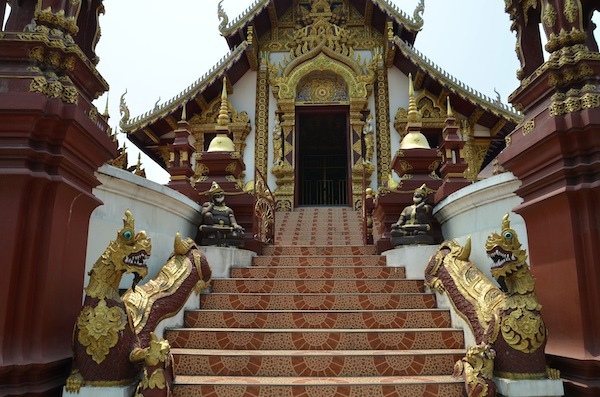 Wat Lok Mali is my favourite in Chiang Mai. It reminds me of a wedding cake with all of those lacey decorations. Love the unusual sculptures too. I love Wat Lok Mali, too. But I can’t pick a favourite temple in Chiang Mai. I love them all for so many different reasons! It was so amazing to catch the ceremony. I’m not sure all of them will remain monks, though, Linda. Often they only stay a monk for a few months, although some stay in the monastery for longer. I’ve been wanting to visit Chiang Mai for years now!! I’m trying so hard to make it a reality for later this year.